Strong consumer confidence and a record shopping spend helped lift retail performance during the holiday season, providing at least a temporary reprieve from the “retail apocalypse.” However, there are still many retailers experiencing financial distress, some of which are likely to end up in default and/or filing for bankruptcy. In December, Standard & Poor’s released a list of retailers that it believes to be at the highest risk of default over the course of 2018. Standard & Poor’s categorized the businesses below based on default risk, explaining: “Here are those companies ranked in order of likelihood to default, with those seen as most likely appearing first.” This list is useful for financial counterparties, especially credit managers, to address and protect dollar risk exposure. The FRISK® score is a proprietary model that measures corporate financial distress, up to and including bankruptcy. The FRISK® score is based on a “1” (worst) to “10” (best) scale, allowing users to easily identify if a business is risky or not. A score of “5” or lower falls into the red zone, through which 96% of public companies pass before they go bankrupt. CreditRiskMonitor disagrees with Standard & Poor’s assessment for Burlington Stores, Inc., as it appears that its default risk is low. First and foremost, Burlington Stores holds minimal risk as denoted by its FRISK® score of “7”. 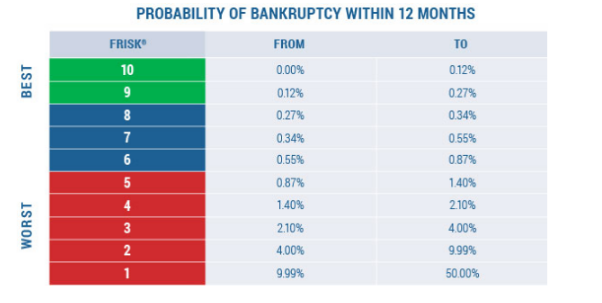 This score indicates the business has a less than 1% probability of bankruptcy over the next year and, in the same vein, a slim chance of defaulting. Despite making S&P's list of risky retailers, we see Burlington Stores as a minimal threat, as denoted by its FRISK® score of “7." Burlington is an off-price retailer that has considerably outperformed the apparel retail sector, supported by consistent low-to-mid single-digit increases in year-over-year comparable store sales. Not only did the operator recently achieve record net sales and earnings, but it also retired more than $450 million of its debt over the course of the last five years. Further, the company has maintained a modest debt-to-EBITDA ratio ranging between one to three times over the trailing 12-month period. Overall, its financial condition appears much healthier relative to the other operators mentioned within the Standard & Poor’s list. In fact, given its strong operating performance and its financial deleveraging history, we believe Burlington should not be considered as a business with material default risk in 2018. Luxury retailer Neiman Marcus Group LTD LLC is just one example from this list, but one that illuminates the severe troubles still facing some within the industry. The company has tried to stabilize performance amid challenges brought on by shifting consumer buying trends. Although, earnings weakness has made its debt load, now exceeding $4.8 billion, much less manageable. In the trailing 12-month period, the company has generated minimal cash flow and its interest coverage ratio, calculated as EBITDA divided by interest expenses, has fallen below a factor of one. As shown below, Neiman Marcus’ FRISK® score has been in the red zone for more than a year, and even fell to the lowest level of “1” in early 2017. We recommend that all credit professionals keep a close eye on Neiman Marcus Group LTD LLC. The most unique element in this case, however, is CreditRiskMonitor’s proprietary subscriber crowdsourcing. Subscriber crowdsourcing tracks the click activity across the CreditRiskMonitor service platform which, in certain cases, can identify concern among credit professionals about particular companies. Put another way, we have found that certain patterns of research can signal increasing financial risk. In this instance, subscriber crowdsourcing began sending a negative signal as early as September 2017, and thereby agreeing with the FRISK® score’s high-risk assessment. Based on these warning signs, we recommend that all credit professionals keep a close eye on Neiman Marcus. The retail industry is changing quickly, and it’s important to separate the operators that have kept themselves in good financial stead versus the ones which have not. Many large, well-known retailers are at risk of financial default sometime in 2018. That being said, we caution that Standard & Poor’s high-risk list may not be complete. CreditRiskMonitor believes that the five other retail names previously mentioned pose material financial counterparty risk over the coming year. In the case of Neiman Marcus, credit professionals appear distinctively concerned about its financial condition, which is being highlighted through subscriber crowdsourcing. With these looming risks in mind, we think now is the optimal time to prepare.